are sold Cooking is more than assembling ingredients from the store, and farmers markets are more than farmers selling produce. They reflect the reemerging culture of small scale farming and the goodness and sense of community that comes with them. With Local Flavors I began to talk about the relationship between food, farming and cooking in earnest. After years of cooking from the farmers markets (and even managing one), I wanted to take a look at farmers markets across the country to get a better sense of what local, seasonal eating really looks like over time and distance. I crisscrossed the US, visiting about 100 markets (Alaska by phone) to see what was there, talked to farmers and recorded their stories about meeting the challenges of growing food. 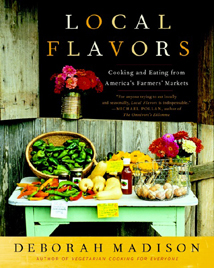 I think of Local Flavors as a portrait of America’s seasons and regions, a book that connects recipes and menus to profiles of farmers and markets. Winner of a James Beard Award and the Julia Child’s Cookbook of the Year.